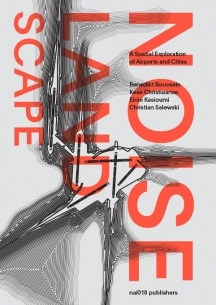 We are proud to announce that The Noise Landscape, A Spatial Exploration of Airports and Cities is bestowed with the DAM Architectural Book Award 2018. 2018 is the tenth time the Frankfurt Book Fair and Deutsches Architekturmuseum (DAM) have bestowed the International DAM Architectural Book Award. Now highly respected, the prize, the only one of its kind honors the best architectural books in a year. 96 architectural and art book publishers from all over the world accepted the joint invitation to participate. On September 04, 2018 a jury made up of external experts and representatives of DAM met to select the year’s ten best architectural books from 238 entries. They based their decision on criteria such as design, content, quality of material and finishing, innovation, and topicality. All award-winning books will be presented at the Frankfurt Book Fair from October 10 to 14, 2018 (Hall 4.1, Zentrum Bild, stand K 109). Freeway feeder roads, a little suburban splodge here, a few remnants of village communities there, interspersed with pastures, wasteland and bland industrial parks – right across the globe the areas around airports are strange non-places that combine to form constantly expanding noise landscapes. Noise Landscape is the first scientific appraisal of this phenomenon and the result of many years of research at ETH Zurich, the Chair of Kees Christiaanse. Eight case studies were conducted on the basis of a European comparison – Amsterdam, Zurich, London Heathrow, Frankfurt, Munich, Madrid, Paris Charles de Gaulle and Orly – to analyze the access, organization and technical cycles of these hubs and examine their spatial potential. Contrary to their generally negative connotation as unbearable sources of noise, the editors prove that alternatives are possible and that intelligent usage reduces conflict. The authors and designers succeed in presenting a topic that is both important and slightly mundane in such a manner that both academics and those new to the topic will appreciate the publication. The chapters are excellently organized and structured and the enormous wealth of information and figures thus never becomes tiring. The graphic design by Dutch Studio Joost Grootens is reader-friendly, all the plans and charts are immediately understandable and (yet) come across as highly appealing.